This employment blog is taken from the U S Department of Labor Bureau of Labor Statistics. Nonfarm payroll employment increased by 312,000 in December, and the unemployment rate rose to 3.9 percent. Health care, food services and drinking places, construction, manufacturing, and retail trade added jobs over the month. 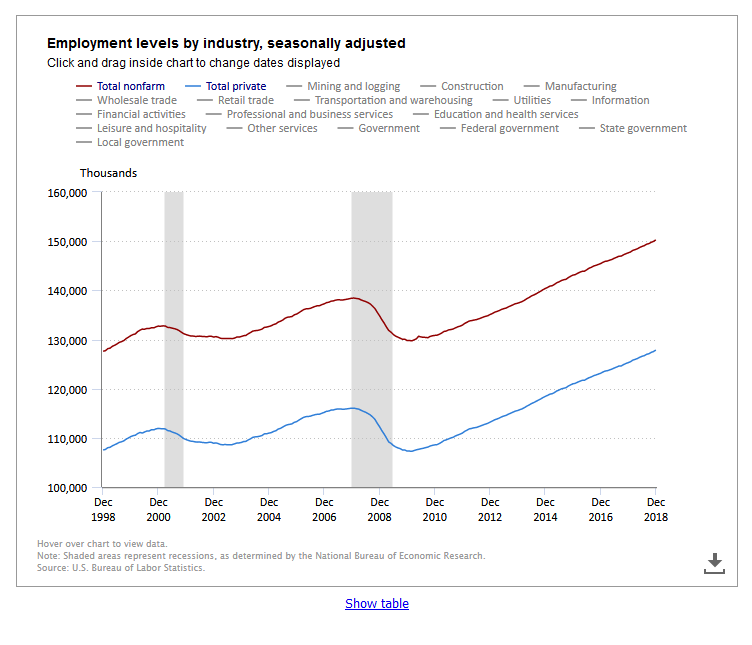 Job growth totaled 2.6 million in 2018, compared with a gain of 2.2 million jobs in 2017. Incorporating revisions for October and November, which increased payrolls by 58,000, monthly job gains averaged 254,000 over the past 3 months. These results are detailed in Charts 1 and 2 below. In December, health care added 50,000 jobs. Within the industry, employment rose in ambulatory care services (+38,000) and hospitals (+7,000). Health care added 346,000 jobs in 2018, more than the gain of 284,000 jobs in 2017. Employment in food services and drinking places rose by 41,000 in December. Over the year, the industry added 235,000 jobs, in line with the increase of 261,000 jobs in 2017. Construction added 38,000 jobs in December, following no change in November. Within the industry, job gains occurred in heavy and civil engineering (+16,000) and nonresidential specialty trade contractors (+16,000) in December. Employment in construction increased by 280,000 in 2018, compared with an increase of 250,000 in 2017. Manufacturing added 32,000 jobs in December. Most of this increase occurred in the durable goods component (+19,000), with job gains in fabricated metal products (+7,000) and computer and electronic products (+4,000). Nondurable goods manufacturing added 13,000 jobs over the month. In 2018, manufacturing employment increased by 284,000, with about three-fourths of the gain in durable goods industries. Manufacturing had added 207,000 jobs in 2017. Employment in retail trade increased by 24,000 in December. Job gains occurred in general merchandise stores (+15,000) and automobile dealers (+6,000). Employment in sporting goods, hobby, book, and music stores declined by 9,000 over the month. Retail trade employment rose by 92,000 in 2018, after little net change in 2017 (-29,000). Employment continued to trend up in professional and business services in December (+43,000). In 2018, this industry added 583,000 jobs, outpacing the gain of 458,000 jobs in 2017. Employment in other major industries–including mining, wholesale trade, transportation and warehousing, information, financial activities, and government–showed little change over the month.